A well-researched study of a Nazi who was tried at Nuremberg and acquitted. Schacht first gained prominence as the banker who solved the hyper-inflation problem in Germany in 1923, for which he was appointed President of the Reischbank. He was an important supporter of Hitler in the 1930-32 period before Hitler became Chancellor and was rewarded by an appointment as Minister of Economics after Hitler took power. 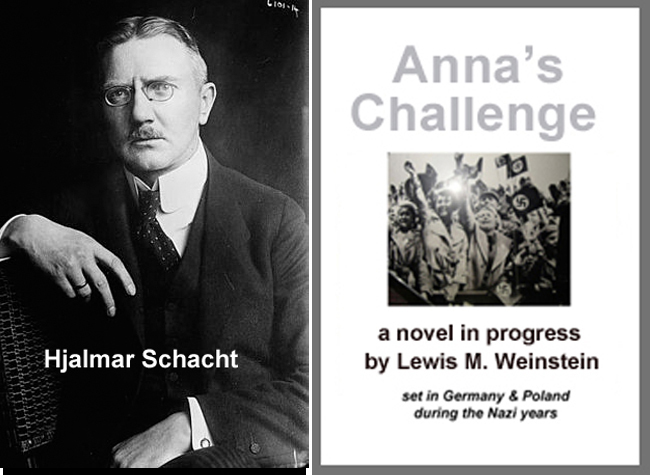 A clear case can be made that Schacht’s association with Hitler was calculated for the purpose of advancing his own career, power and fame. Schacht was instrumental in providing the funds for Germany’s rearmament program, including the invention of the notorious MEFO bills (promissory notes based on nothing used to hide the extent of Germany’s rearmament). He fought with Goering over economic policy and lost when Goering’s Four Year Plan – totally devoted to war production at the expense of consumer-friendly policies – was adopted by Hitler. Schacht became a major participant in several anti-Hitler plots, including the pre-Munich plot in 1938. Subsequently, Schacht publicly antagonized Hitler and was removed from all positions, later to be arrested and sent to a succession of concentration camps. Liberated from Dachau by the Allies in 1945, Schacht was immediately arrested and brought to trial at Nuremberg, where it was judged that his anti-Hitler activities outweighed his role in preparing the German armed forces for war. The judges apparently believed Schacht when he insisted he thought Hitler was rearming for defensive purposes only. … as this planning was ongoing, Hitler’s success with Chamberlain at Munich undermined the planned coup … amidst public rejoicing that territory (Czechoslovakia) had been added without war, both the generals and the nation as a whole came to believe that Hitler knew best how to handle international problems … Hitler had been right and Schacht wrong regarding what the English would do … Schacht lost prestige among the generals. After his acquittal at Nuremberg, Schacht founded a private banking house in Düsseldorf. He also advised developing countries on economic development. He died in 1970 at the age of 93. This entry was posted on December 14, 2014 at 1:02 pm	and is filed under ** RESEARCH for A FLOOD OF EVIL. You can follow any responses to this entry through the RSS 2.0 feed. You can skip to the end and leave a response. Pinging is currently not allowed.